Over the last 24 months, investor credit has been all but cut off through strict serviceability policies. Increasingly prudent lending criteria has forced major Australian lenders to follow suit, with the volume of investment lending constrained throughout our credit sector since early 2017. 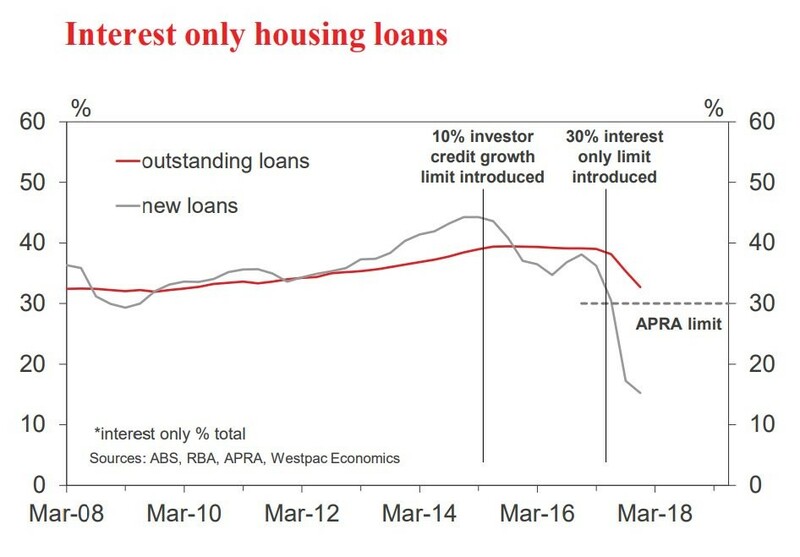 Interest only loans and lending on deposits lower than 10% in particular have been significantly restricted, with the regulator aiming to cool Australia’s rapidly moving housing markets. The consequence of this credit squeeze has been a short-term dampening in the investor sector, with the volume interest only loans falling to below half of previous levels. The below graph that analyses RBA data, represents just how conservative the banks have become. Investment lending has felt the crunch since mid-2017, with investment loans falling to just 16% of new loans (down from more than 40% in the years before credit caps were introduced). This artificial credit squeeze now seems to be wanning in the wake of recent policy changes by ANZ. As of Monday March 25th, a loosening of credit restrictions will see the financier offer buyers an interest only period of up to 10 years on new investment loans. While this will double the currently existing maximum interest only period, the new policy will also allow investors to secure loans with 10% deposits. This marks a turning point for investors, as the availability of credit will provide an appealing avenue for Australian buyers to leverage quality portfolios. But more importantly, the policy changes show that major lenders have recognised the restrictions have served their purpose in the investor market. The move acts as clear indication of efforts to generate further growth in our residential markets. Ultimately, ANZ’s return to the investor market is a small piece to a bigger puzzle. This marks the turnaround from the lending sector, the consequence of which will see competing financiers soon follow in an attempt to capture the demand from Australia’s ever persistent investment market. The result of which, will be more opportunity to invest effectively and increased options for everyday Australians.